I always enjoy Lee Child’s Reacher novels. Hubs and I often listen to them while on the road. Eight hours of driving flies by when you’re fighting your way across the USA, or in the case of The Hard Way, the USA and England. 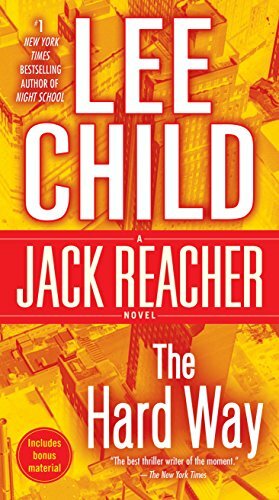 I particularly enjoyed the theme of this story, and the way Child dribbled tiny innocuous clues throughout and then cobbled them together in Reacher’s penultimate realization which led to the ultimate showdown. I liked the characters, too, the way Lee brought to life the various sisters, their loyalty, their willingness to fight for and defend those they love; they way he raises women up and reveals qualities that some might criticize as weakness–compassion, and denial (refusal to accept no as answer)–as strengths worthy of celebrating. Lee usually does a good job of portraying strong female characters, and this story is bang on. If you like action novels and or movies, chances are you’ll like this book. Caution: it’s not for the squeamish; a couple passages of description of the realities of war is a bit brutal.